In 1191, when it became a member of the Cinque Ports as a limb of Hastings, Winchelsea lay east of the mouth of the Rother, near the site of present-day Camber (VCH 9 p62). Shortly after 1294-9 this site was abandoned as a result of erosion. This clearly did not come as a surprise, for as early as 1283 Edward I, following a pattern more common in his domains in southern France, had caused a low hill by the river Brede at Iham, in the parish of Icklesham, to be acquired for the construction of a new town with a harbour. Like a French bastide, new Winchelsea was built on a rectangular plan with 39 blocks. Its success was limited for the harbour was prone to silting and French raids in the C14 and C15 did much damage. It is unlikely that all the blocks were ever built up and the present-day town covers only twelve, one containing the church. Winchelsea on its old site appears to have had two parishes and this determined the number in the new town, to avoid the clashes of interest that would have followed any attempt at reduction. The dedication of the main church to St Thomas-à-Becket may have been changed from plain St Thomas in the old town. The other church, St Giles, was on the site of the later rectory. Because of the failure of the town, the parishes were united in 1543, though ruins of St Giles were still to be seen in the C18. A third church, St Leonard, at the western end of the hill, was the church for Iham and may have predated the new town, but it was never fully parochial and remained subordinate to Icklesham. It ceased to be used around 1500 (ibid p75) and the last ruins were replaced by a windmill in the early C19. The high quality of architecture and some specific detail suggest the church was probably begun about 1290 for the new town under direct royal patronage. It consists of the chancel of a hall-church with side-chapels of equal height and was intended to be cruciform. The ruined transepts were almost certainly never finished and the nave can have been barely started. There are fine early C14 monuments and fittings. The new church was planned with a chancel, side-chapels, transepts and an aisled nave. The completed chancel and chapels (which are in effect aisles in the absence of a nave) are all the same height and thus form a hall-church, a type common in Germany and the Low Counties. Jean Bony (p34) suggests that the reason for choosing this type may have been the increasing influence of the friars, who as preachers required good sight-lines. Bony also provides the most likely starting date of 1290. In the course of assessing the position of Bristol cathedral (formerly St Augustine’s abbey and also a hall-church) in the European gothic of c1300, Christopher Wilson stresses the influence of Michael of Canterbury (see 4 passim), whom he regards as the most significant master in eastern England of the period. 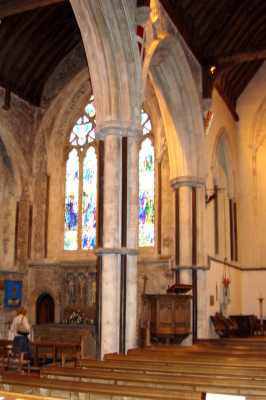 He attributes Winchelsea to Michael, in particular citing the pierced parapets and the profiles of the arcade-arches (ibid p118), which he compares with Michael’s documented work, including the now largely vanished St Stephen’s chapel at Westminster, which was a royal commission like Michael’s Eleanor Cross in Cheapside (dated to 1291-94). Alternatively, John Harvey, who does not make a similar attribution to Michael, saw links with Walter of Hereford (Dictionary p137), who worked for Queen Margaret on the long-lost Greyfriars Church, London. A third possibility is Thomas of Witney, who Paul Binski (p141) suggests may have been involved at an earlier date than his known work at Exeter and Winchester cathedrals and who, he further suggests, was aware of the the work at St Stephen’s chapel. 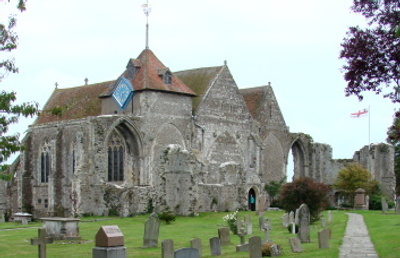 There is no documentary evidence that supports any of these attributions, but the very fact that they can plausibly be made serves to demonstrate the close ties between the leading masons of the period and all three underline the importance of the construction of Winchelsea church among the building projects connected to the Crown in the final years of the C13. Of the three specific attributions, that by Wilson to Michael is the most closely reasoned. 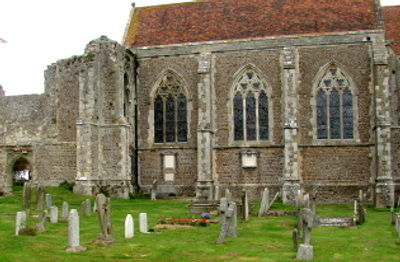 The hall-church arrangement is a further reason for associating Winchelsea with masons in royal employ, for they were particularly associated with this type. One of the few other instances in the south of England, though slightly earlier in date, is Stone, Kent and royal masons are thought also to have been involved in this. The three-bay chapels have three-light windows with split or barbed cusping in the tracery. This feature is generally associated with Kentish work of the period, though there is some on a more modest scale at Rusper, West Sussex and examples exist as far north as Kirkham priory, North Yorkshire (Hart: Medieval Window Tracery p68). Each head has three spherical triangles, containing barbed trefoils, and a string-course links the sills. 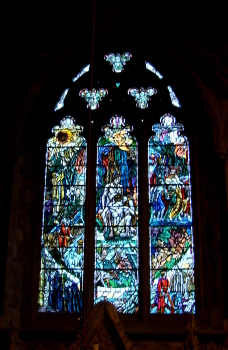 The five-light east window of the south chapel is similar. The corbel-table and a pointed north window of the modern vestry east of the north chapel were probably taken from a mediaeval one on the site (VCH 9 p73). The sanctuary has two light side-windows with barbed quatrefoils and a parapet, pierced with trefoils. In their present form the windows date from 1850 (VCH ibid) as they were previously blocked, but the tracery is said to incorporate fragments of old work that were found (2 p164). Beneath this are carved grotesques, some of them still the originals though many have been imaginatively replaced, probably during the restorations of the C19 and C20. A depressed-headed doorway leads to a barrel-vaulted crypt under the altar. The Burrell Collection drawing (1784) and the two Sharpe Collection ones (both 1797) show that the tracery of the main side-windows was restored faithfully in the C19 and that the parapet of the sanctuary is authentic. As the church is a fragment of three bays, the interior is not large, but since it is the same height throughout, it is deceptively spacious. The piers of the arcades combine four shafts of marble and four thicker stone ones, with matching responds. All have rings and simply moulded capitals. The heads have complex mouldings, divided into three sections, and the labels have head-stops, which are a speciality here. The wooden roofs are original, though the tiebeams and crownposts remain only in the north chapel; the lack of vaulting shafts on the piers shows that such a roof was intended from the start. The mullions of the windows are shafted inside and their rere-arches have further shafts of marble, flanked by narrow blank arches with traceried heads. The outer heads continue to the apex of the windows, creating a depressed super-arch. The awkwardly tapered spaces below the super-arches create an unhappy effect, particularly in the broad east window, which has an almost semi-circular outer arch. The string-course in the chancel linking the sills is of marble. The piscinae and sedilia belong to the architecture, but are listed at the end for the sake of conformity. The eastern parts were probably complete by 1312, when the first chantry was founded (Bony ibid). Three arches across the western end, of which the centre one is broader, were conceived as the eastern side of a crossing, which would probably have had at least a low tower. The responds lack any marble, but are otherwise similar to the piers further east. The east walls of the transepts stand almost to their full height, each with a large but fragmentary window like the chapels, so there can have been little or no interruption in building. One significant change is the shafted rere-arches, with wall-arches and moulded heads, an altogether happier design than the equivalent arches in the eastern parts. The shafts have rings and, as in the earlier work, head-stops on the labels. The remainder of the transepts is more fragmentary and the detail suggests that building continued for some time, but slowly. The curling stops on a doorway in the north wall of the transept are later C14 and though the surviving base of a window in the west wall of the north transept shows the wall-arches were retained, building may have extended into the C15, the date of the south doorway in a square frame. The window above started as a large traceried window like the others, but it was blocked and a smaller C15 window was inserted in it. This large window may never have been finished, for the blocking shows the roof-line of a C15 porch, of which foundations remain. The quality of work is poorer and the foundations of a five-bay nave reveal no detail, though it was presumably intended to continue it as a hall church. Stone is said to have been taken about 1790 to repair Rye harbour (VCH 9 p74), but it is unlikely that much more than what can now be seen was ever constructed. Nothing is known for certain about the reasons for abandonment, but the steep decline of the town by 1400 was probably sufficient reason. Even at Hastings, significantly more prosperous, it was only possible to rebuild the churches slowly after late C14 French raids. 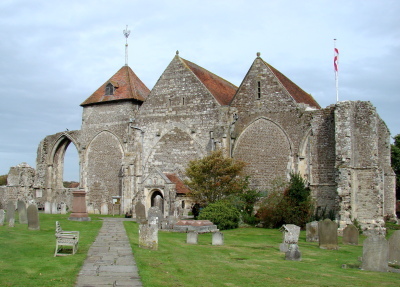 At Winchelsea, work on the nave probably ceased, the transepts were abandoned, and the west arches of the chancel and chapels were blocked permanently. Corbels above the central arch suggest there was at some time a temporary roof over the crossing. In 1933 carved stones were found in the blocking of the central arch (ibid p73), which may have been intended for use in further building or have come from ruins, as may the ashlar filling of the arches to the chapels. In the late C14, a flying buttress was added to the north chapel and Adelaide Tracy (before 1857) (IV p101) clearly shows C15 panelled tracery in its east window. That of the chancel was probably replaced at the same period, for Sir Stephen Glynne, probably after a visit in 1826 (SNQ 18 (Nov 1968 p44) described the window as ‘of rather singular tracery in which the Curvilinr and the Rectilinr are rather mixed but the latter seems to prevail’ (ibid p43). This is not entirely clear, but the fact that the present east window is certainly C19 indicates that the previous one was not original since it would not otherwise have been thought necessary to replace it, so the probability that it was also C15, perhaps early, is strong. Further work dating from this period includes a west porch built on to the blocked main chancel arch to provide access to the church. It marks perhaps the final decision to abandon further building and though it has a C15 doorway with a square frame and foliage in the spandrels, it is not necessarily in its original state for this may have been reset. Such a supposition is strengthened by the curious oval side-openings, which seem to have been assembled from fragments. Much other detail looks C16, with rough angel-stops and ogee-headed recesses in the gable with panels bearing shields, and this may be when the porch assumed its present form. The Sharpe and Burrell drawings show the present arrangement of a low timber belfry with a pyramid cap, placed over the west end of the north chapel around 1760 (Langdon p225). The north window below was blocked to provide more stability. This structure was in place of a detached stone belfry of uncertain date in the churchyard, which lasted until c1790 (Lower II p256) and was probably intended to be temporary. As regards the interior at this time, Glynne remarked on the amount of whitewash. Otherwise the church seems to have been in reasonable condition, though according to Lower the piscina and sedilia in the chancel were in fragments until they were restored in the C19. Work in the C19 and early C20 was extensive, but is poorly documented. A grant from the ICBS in 1850 to repair the roofs and arcades, with new pews, lapsed unclaimed. The architect was named in the application papers as A D Gough. 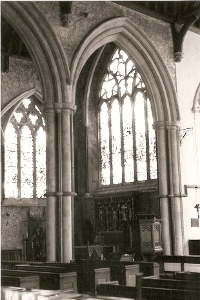 However, the unblocking and replacement of the side-windows of the chancel in 1850 shows that there was work at this date. In 1860 The Builder (18 p676) reported repairs to the interior in the previous nine or ten years under Messrs Smith of Rye (i e A Smith and/or C Smith), paid for by Thomas Dawes of Winchelsea (2). This private generosity may be the reason for not taking up the ICBS grant. The work as described sounds much like that in the ICBS application and since both Smiths were primarily builders, who would have been widely regarded by this date as unsuited to take the lead in the restoration of such an important church (see Sompting, West Sussex for a documented instance of such a view), they may have followed plans by Gough or someone else. Another major alteration dating from well before 1860 is the present Decorated tracery of the main east window, which Adelaide Tracy shows and was thus in position by 1857. As noted above, that of the east window of the north chapel,was replaced at an uncertain but later date. In 1903 plans were announced for a further restoration by J T Micklethwaite, linked with his former partner Somers Clarke junior, which was to cost £7000 (CDG 120 p145) including a vestry (presumably that east of the north chapel). Work continued for some years and though Kirkman in 1908 mentions recent repairs by them with the implication they were complete (3 p294), there are later indications they were still in progress. Thus, in 1909 the cost was reported as £5000 (B 97 p21), which might suggest a scaling down of the plans. Micklethwaite had died in 1906, but his name continued to be associated with the work. There is an even later reference to the restoration in progress in 1911, when the estimated cost had reverted to £7000 (KD/S – I am indebted to Nicholas Antram for this point). ICBS records in that year indicate that work ended then and still mention Micklethwaite’s name, but in addition give that of his former pupil A G Wallace. This suggests that Wallace alone was responsible by then, particularly as Somers Clarke had largely withdrawn from practice by this date. Within 20 years, there was further work. Even if Langdon’s date of 1922 for the removal of the crownposts from most roofs is too early, there was definitely a restoration by M McCartney in 1931. This included a west organ gallery (BE(E) p673) and he may also have opened the north west window of the north chapel, probably blocked since 1760, together with related fittings and glass. There were more repairs in 1960 by J D Wylson (ICBS). 1. (South east transept wall, outside). C14 with a pointed head and curling stops. 2. (East wall of south chapel) Early C14, square-headed with a quatrefoil frieze along the top. Benches: (West end of south chapel) The sole survivor of the box-pews removed c1850, lined with baize. 1. (South chancel by sedilia) For images, supported by an angel. 2. (South chapel, near sedilia) Also for images and borne on a crouching figure. 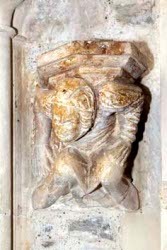 Brass: (Mounted on south chancel wall) Small civilian of c1440 with missing feet. 1. (Formerly on bracket in south chapel) Mutilated draped torso, too damaged to be dated. 2. (North chapel) Large C17 Continental effigy of the Virgin and child. Chest (In south arcade) Almost certainly C17, with shallow arcading on the front. Graffiti: A good selection of pre-Reformation marks, including ships (befitting in a church so closely linked to seafarers when first built), knights and heraldry. 1. (North sanctuary window) Fragments of C15 glass from the C15 east window, which was sold off as souvenirs after it was replaced (2 p171). 2. (East and all chapel windows) A scheme of 1928-33 by D Strachan, which was commissioned by Lord Blanesborough (P Cormack: Arts and Crafts Stained Glass p299) and is a late example of the cycles for which Strachan was famed. The windows contain both symbolic and worldly elements. Thus, three in the north aisle are a memorial to the fallen of World War I and the rest to members of the donor’s family (A C Russell p47). The colouring, especially the blues, and heavy leading hold the compositions together, and make this some of the most successful glass of its date, despite conventional drawing. 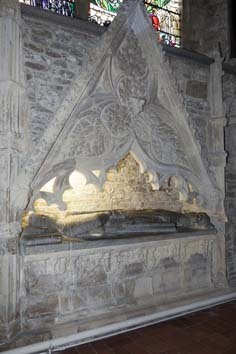 In his writings, Strachan showed himself aware of the need to accommodate his designs to the elaborate C14 tombs beneath in both aisles (see below). Not all were convinced for the SPAB was concerned that the glass might overpower the architecture (Cormack ibid) and more recently Simon Watney has argued along similar lines (p82), criticising in vehement terms their colour, drawing, style and indifference to their surroundings. At the very least, the divergence of opinion suggests that they are out of the ordinary. Those in the north chapel and the chantries in the south one are almost certainly connected with the Alards, who were leading merchants of the new town in its early years and Barons of the Cinque Ports. They were involved in the wine trade with Gascony (Millward and Robinson p164). The form of the tombs on the north side in particular is influenced heavily by the royal tombs at Westminster (Saul p159), though unlike those, these are not free-standing but placed against a wall. In view of the Alards’ status as merchants, it is difficult to overlook the aspirational nature of these tombs. 1. (North chapel) Along the side-wall are three canopied tombs, elaborately cusped with ogees and triangular gables, which rest on large heads and are subdivided into long pointed trefoils and, in the centre of the two side ones, big projecting bosses. The trefoils are covered in carved foliage. The tombs are separated by little crocketed pinnacles and ogee-headed niches. The Purbeck marble effigies show a knight, a lady and a young civilian. They were long considered later C13 (e g VCH 9 p74); following a tradition going back at least to 1635 (1 p5), they were said to come from Old Winchelsea. However, recent research into the costumes has dated them to c1320-25 (ibid). As with the architecture, with which the tombs are closely linked, the fine work shows links to London and possibly also to Canterbury masons. 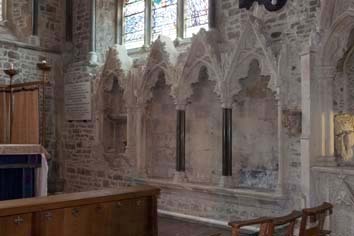 The similarity with the tombs in the south chapel suggests they are also to members of the Alard family, probably Robert, his wife Isabel and brother Henry, who are commemorated by the chantry of 1319 (see below). Though apparently in situ, these are likely to be the three ‘knights templar’, of which one was recorded in a vestry in 1824 (GM 1824 pt II pp599-602). (i) The earlier, under the centre window, probably commemorates Gervase Alard (d1310) whose son Stephen founded a chantry in 1312, followed by Robert Alard’s in about 1319. The main structure is divided into three parts, of which the much broader middle one is canted out and its arches are cusped and sub-cusped with ogees on the central one, and tall gables, ornamented as in the north chapel, with a head in the centre of the middle one, whilst most of the diaper-work that covered it remains. The restrained use of ogees suggests the whole structure is slightly earlier than the tombs in the north chapel, though the work is of similarly high quality, as for example the elegant head-stops on the centre opening. The tomb chest beneath has broad but shallow niche between smaller ones. The armoured effigy holding a heart is stone not marble, but the detail is consistent with a date of 1320-25. 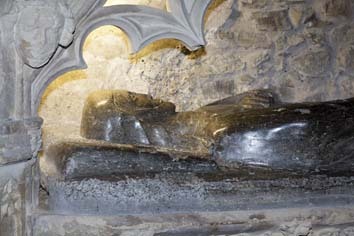 (ii) The second tomb, probably that of Stephen Alard (d 1327 or 1330), is also in three parts, but not canted. The similarities extend to the stone effigy. It is likely to be the latest of the series, for the openings are more clearly separated and ogees are no longer found, whilst the head-stops are proportionately larger. 3. (South chapel) Reynaul Alard (d1354) A stone slab, bearing a foliated cross with a figure at the centre and the indents of an inscription. 4. (South chapel, west wall, top row) Drake Hollingbery (d1821) by G Lupton (Roscoe p768, who, following Gunnis, gives the name as ‘Drake Clerk’). The adjacent memorial to Hollingbery’s children (d1843 and 1844) must be by the same hand. 5. (South chapel, west wall, second row) Richard Greenland Denne (d1839) etc; tablet by M Vidler (ibid p1314). Painting: (At the back of a recess in the south chapel) An angel, holding the soul of the departed in a napkin, was visible as recently as the 1970s (vidi), but nothing recognisable is left. According to Sally Badham (Medieval Church and Churchyard Monuments, Oxford 2011, p18) painted devotional pictures in such positions were frequent but few have survived, making this a grievous loss. 1. 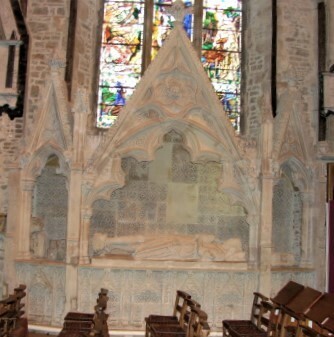 (South chancel) Original, like the adjacent sedilia (see below), with cinquefoiled heads under crocketed gables with pinnacles. The canopies are vaulted with diaperwork on the lower parts of the back. It was re-assembled in the C19 (see above), but there is no obvious sign of this. 2. (South chapel) As in the chancel, this is closely related to the adjacent sedilia (see below). Both are a little later, for the heads have ogees, elaborate double cusping and ornate crocketed gables on clustered marble shafts. Despite restoration, the relationship with the Alard chantries is clear. 3. (South east transept wall, outside) C14 with a trefoiled head and a shelf. Reredos: (North chapel, east end) H S Goodhart-Rendel, 1933, in a gothic idiom with figures, and including the altar (CDG April 1933 p154). 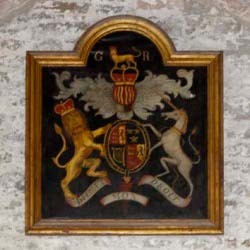 Royal Arms: (South chapel west wall) Painted panel with George III before 1802. 1. 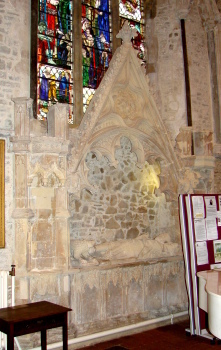 (South chancel) Triple and closely related to the adjacent piscina, though the canopies are supported on marble shafts. It is more obviously much renewed. 2. (South chapel) Also triple and also an entity with the adjacent piscina (see above). Tiles: (North chapel) Area of mediaeval tiles, probably C14 or C15. 1. My thanks to Nick Wiseman for the photographs of the effigies in the north aisle, the sedilia and piscina, the bracket and the Royal Arms. 2. My thanks also to Tim Cornish who drew my attention to the article by Christopher Wilson cited above, which might otherwise have passed me by.